I love the smell of the Harissa Seasoning. It is a bold blend of smoked paprika, chilies, garlic and more. The same flavors normally found in harissa paste. 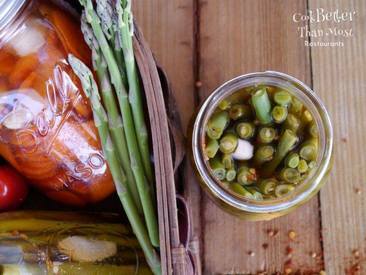 Harissa dry spice lent itself to pickled veggies so well. The cauliflower and green beans were our favorite Harissa Pickled Vegetables, but so far everything we have soaked in this simple but powerful brine has been great! Lately I have been making all kinds of refrigerator pickles with my different flavors, not just basic garlic or dill and the harissa spice might be my new favorite. My husband and I have been enjoying them on everything from wraps and sandwiches to garnish for a bloody Mary. I even put out a tray of them for an appetizer before a dinner party last week and they were a big hit.